I’m going to start this blog by repeating some of what I wrote about Magico’s limited-edition, tenth-anniversary M Project loudspeaker, since Magico’s new M Series flagship, the M6, wouldn’t exist without it. After this, I will delve into how the M6 differs from its superb predecessor (and it differs quite significantly) and how those differences affect its presentation. It has been my contention that no listener is purely one of these three types: that a delight in accuracy, musicality, and realism are common to all listeners, although one of these three “biases” tends to predominate (or at least it does most of the time). The trouble is that it is next to impossible to find a single transducer that will please all three palettes in equal measure. So where does a lover of Béla Bartók, Ray Brown, and The Beatles go to get the essential piece-performance-venue-and-recording detail, the lifelike tone color, weight, and transient response, the thrilling dynamic range, particularly in the bass, and sheer SPLs that each of these composers and musicians requires in significantly different proportions? What had changed? In two words, the box. The M Project was the first “statement” Magico (since the M5) that did not use an all-aluminum enclosure. It was also the first “statement” Magico with an aerodynamic shape. How this was accomplished without sacrificing the resonance-canceling blend of mass, stiffness, and damping of the all-aluminum boxes involved a neat (and costly) bit of engineering. The M Project enclosure had a newly designed curved shape that tapered gradually from front to back, eliminating the parallel walls and sharp, potentially diffractive edges of Magico’s traditionally “squared-off” aluminum boxes. Instead of employing thick aluminum plates for sidewalls, the M Project used sidepieces of carbon fiber (one of the stiffest, strongest materials around). According to Magico, these curved carbon-fiber sidewalls minimized internal resonances and greatly reduced the amount of internal damping that was required. In addition to its curved side plates, the massive aluminum front and rear baffles were milled into curves, while the equally massive (two-inch-thick) aluminum top and bottom plates were CNC-machined to have edgeless contours. In other words, the M Project enclosure was designed to have the lowest number of potentially diffractive surfaces of any statement Magico since the Mini and Mini II. Like the M Project, the new M6 is a five-driver, three-way floorstanding loudspeaker with a sculpted carbon-fiber-and-aluminum box. 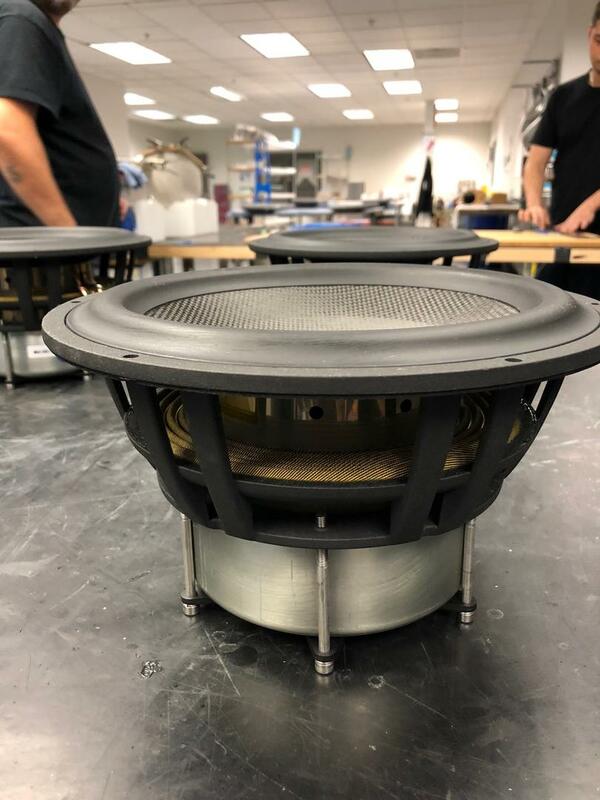 While the driver complement is the same as that of the M Pro (one 28mm diamond-coated beryllium tweeter, one 6" graphene-carbon midrange, and three 10.5" nano-graphene woofers), the drivers themselves have been improved (I’ll have more to say about this in a moment). More importantly, the monocoque enclosure has been considerably improved, making for what Magico claims is its quietest cabinet ever. By using the purest carbon fiber for its sidewalls, milling the top and the bottom caps into even more diffraction-free curves and arches, and further smoothing all the joinery, Magico has created a seamless, almost egg-shaped, carbon-skinned-aluminum enclosure that, when sitting on Magico’s remarkable constrained-layer MPod feet, allows the drivers to propagate with audibly less interference, as if they were floating in free space. It is, in large part, this uncanny sense of “boxlessness” that makes the M6 sound so much like the Maggie 30.7, albeit a 30.7 with a fuller power range, less sting in the treble, and more realistic top-to-bottom power, punch, and three-dimensionality. As I said at the start, the net result of these changes is, IMO, the best big Magico yet—the least present (in the sense of box or driver colorations), the most transparent, the most delicately detailed and simultaneously powerful, the most realistic. To hear a great LP of a vocalist, like Dean Martin on the exceptional Analogue Recordings reissue of Dream With Dean, through the M6 is not just to hear a wonderful singer singing wonderful songs in wonderful sound. It is to hear Dean Martin, gone now almost 23 years, live again—there in front of you, standing in the studio he was recorded in, with that U47 hanging a few inches above his face. It is to bring back the past wholly intact. The M6 is a non-discriminatory re-animator. It does this same horripilating “back from the past” trick with fiddles like Nadia Salerno-Sonnenberg’s Guanerius on Prokofiev’s firelight-on-frosted-windowpane First Violin Sonata [MusicMasters], grand pianos like Sandra Rivers’ gorgeous Baldwin on this same Prokofiev disc (Rivers’ sforzandos are simply phenomenal—translated by the M6s with goosebump-raisingly realistic power and absolutely no thinning of tone color), drums, bells, and other idiophones such as the big ensemble of percussionists who add their shifting colors and rhythmic accents to the Klangfarbenmelodie of Luigi Nono’s Polifonica—Monodia—Ritmica [Time], cellos and basses such as the choirs in Britten’s Four Sea Interludes [EMI] with their mournful ebb and flow punctuated by the bright sea-bird cries of flute and piccolo. The M6 even does this trick—though we had to send Alon Wolf out of the listening room to find out—at very loud level on hard-hitting rock ’n’ roll, reproducing the disco-licious bass guitar, drumkit, and synth on Blondie’s Parallel Lines [Chrysalis] with the same magical realism it brought to acoustic instruments. The M Project was, IMO, the first Magico to add fully lifelike power-range beauty and muscle to Magico’s transparent and neutral palette, which made it the first Magico with equal appeal on every kind of music from rock to Rachmaninoff. The M6 takes this all-genre sonic appeal several steps closer to perfection. The M6 is not merely gorgeous and thrilling sounding, though it is both of these things (at times it reminded me a bit of one of Andy Payor’s superb Rockport speakers, albeit with better bass extension); it is also getting the harmonic/dynamic envelope more right than other Magicos I’ve heard. I assume this is because its “invisible” box is letting its improved drivers do their work more accurately. As a result, attacks, sustains, and decays are extremely naturally reproduced, with neither starting transient nor steady-state tone nor stopping transient being overemphasized by resonances added by the enclosure (or by the drivers themselves). This makes for an astonishingly beautiful, liquid, open, bloomy, and “organic” presentation, closer to the way instruments sound in life. Having just come off the mind-boggling experience that is the Magnepan MG30.7, I wasn’t sure how I was going to react to yet another dynamic speaker in a cabinet. Once heard, the big Maggie’s boxless, “freed-up” presentation—with its lightning transient response, sensational resolution of musical detail, and uncannily natural tone color—is indelible. But the M6 matches it, strength for strength. Indeed, it exceeds it in the treble and the power range and the bass, where, as superb as they are, the MG30.7’s true ribbon and huge twin bass drivers are comparatively limited in power-handling and dynamic range (due to driver-excursion limits). While it is true that the M6 does not have quite the same lifelike size as the 30.7s on really big instruments (such as Clifford Curzon’s concert grand on the great Decca recording of the Brahms First Piano Concerto with Szell and the LSO [ORG]), it has much fuller low end and power-range color and impact (startling impact on tuttis). Moreover, unlike the Maggies, the M6 doesn’t make smaller instruments or voices sound outsize or bring them forward in the mix or add excessive sting (once again due to excurision limits) to high-pitched instruments played very loudly. In sum, it is far more naturally robust and faithful-to-sources and, ultimately, realistic. Of course, it is also far more expensive. And it has competition. I’m not going to go through a list of contenders, as I did with the M Pro, and what they have to offer that equals or is superior to the M6, and that is because (this time around) I don’t think any of them is superior to this Magico. But I understand that most of you: a) don’t have the money for this marvelous contraption; b) are already happily living with alternatives; and c) resent having your babies called ugly. Well, I’m with you. I don’t have the money either; I’m quite content with the Maggies; and it wasn’t easy to say that I think the M6s are a good deal better. However, my job is to call ’em as I hear ’em, and the way I heard this one—throughout three days of close listening to my own recordings—left me feeling there’s a new sheriff in High-End Town. Obviously, I’ll have more to say about the M6 if and when I actually get them into my own listening room. But I kinda doubt the bottom line’s gonna change. 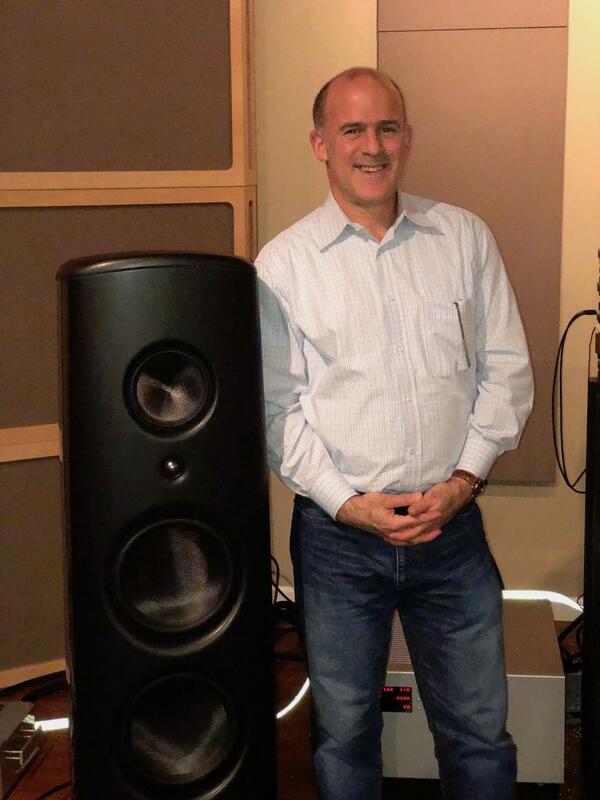 If you've got the dough and the Right Other Stuff (I was listening to a combo of Soulution, CH Precision, Clearaudio, Kronos, AMG, DS Audio, Berkeley Audio, and MIT—I won’t even guess its cost), and hanker for the very best that can currently be had, the $172k M6 is the speaker I recommend.